When are the best years of an individual's life? Generally speaking, most would say the college years and/or early 20s, at least when speaking to those experiencing that era. From a physical standpoint, that very well may be true. The signs of aging—be they changes in hearing, bone strength, vision, stamina, or appearance—have not yet begun, and risks for a variety of diseases are lower. However, well-being is not solely designated to the physical. Emotional well-being and mental health are just as vital. While the 20s may seem like a decade of carefree decision-making when individuals have more than enough time to make up for foolish mistakes, the truth may be a little more fraught. In college and immediately afterward, individuals are expected to choose a career path, find a partner if desired, decide whether or not to have children, start paying bills, locate stable and affordable housing, develop/maintain friend groups, find an adult place within the family, and much more. On the other hand, older adults—those past middle age—have often settled those concerns or have had the opportunity to develop skills that make those challenges less stressful. That's not to say there aren't hardships and stressors. Take, for example, retiree Kathy Ross. "I am 61 years old now," she says. "I am back in school and feel old and tired. Additionally, my mom, who is 93 years old, requires a lot of care now, so I am doing a lot with her." But when asked how she feels generally, Ross' response is positive: "I feel that my happiness level is high. I certainly have down days but can often bounce right back." And she's not alone. Evidence that older adults have a more positive psychological well-being is not simply anecdotal. Researchers at the University of California, San Diego (UCSD) School of Medicine conducted a recent study that found that the mental health of older adults may in fact improve over time. "Our results suggest that the traditional conceptualization of aging needs revising," says Dilip V. Jeste, MD, senior associate dean for healthy aging and senior care, Estelle and Edgar Levi Chair in Aging, and distinguished professor of psychiatry and neurosciences at UCSD, "to account for what appears to be 'normative' improvement in mental health or psychosocial function. Stereotypes of 'grumpy old people' may have the situation backwards." The study, "The Successful Aging Evaluation (SAGE)" looked at adults ranging from age 21 to 100 and attempted to account for all aspects of aging. "Traditional conceptualizations of aging focus on physical and cognitive declines. There have been very few studies of psychosocial aging," Jeste says. "We were interested in finding what happens to all three aspects of functioning with age: physical, cognitive, and psychosocial functioning." To best understand the psychosocial component, the researchers examined six different measures of mental health. Three were considered positive; three were considered negative. "The three measures of positive mental health included well-being, happiness, and satisfaction with life," explains Michael Thomas, PhD, assistant research scientist in the department of psychiatry at UCSD. "The three measures of negative mental health included depression, anxiety, and perceived stress." Perceived stress, he says, is subjective rather than objective. For example, one individual may find a task such as moving extremely anxiety inducing, while another may not be troubled by the same idea. "All of the measures of mental health are subjective," Thomas continues. "They were rated by the study participants themselves on a survey questionnaire they completed at home. In contrast, cognitive function was assessed with a cognitive test of memory, learning, attention and other indicators of brain function, administered during a phone interview." The SAGE researchers were able to conduct the study with 1,546 individuals. There were, of course, limitations. "We obtained the data cross-sectionally. The younger and the older individuals were examined around the same time and not followed over decades. Because of this, we cannot be certain whether differences in mental, physical, and cognitive health are due to aging or generational differences, and whether the findings of better mental health in older people are a result of 'healthy survivor bias,'" Jeste notes. He continues, "The sickest people die young and only healthier people live into old age; therefore, the older individuals in the study are 'hardy' folks. [However], while some contribution of the health survivor bias to our results cannot be ruled out, please note that the older adults in our study did have both physical and cognitive declines and, thus, were not super-strong agers." Jeste further notes that the SAGE study is currently attempting to overcome that limitation with a longer-term examination. "We need to know more about how people change by following them over time, which is the next step for our SAGE study," he says. "We also want to understand what specific skills and abilities older adults acquire that facilitate their better mental health. One possibility is 'wisdom,' which is an active area of research for our group." In the interim, the results from the first aspect of SAGE are positive when it comes to aging and mental health. "We found that, despite accelerated declines in physical and cognitive functioning, mental health actually seems to improve steadily over the adult lifespan," Thomas says. Thomas and Jeste note that not only were the psychological impacts of the stressors differing by age but so were the types of stressors. 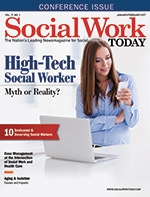 For social workers, what does that mean? It certainly isn't a license to make assumptions. Improved mental health with time is not a universal truth. Service providers cannot assume that their older patients' needs are limited to the practical or physical and ignore the psychosocial. "Our study revealed trends in the data, but there are individual differences in mental health at all ages," Thomas cautions. "Not all the younger adults are depressed and not all the older adults are happy." There are, however, lessons to be learned. For one, it's possible that many older adults have developed an emotional resilience from which younger adults could benefit. "Older adults demonstrated better mental health compared with younger adults despite having greater physical disabilities and cognitive impairments," Jeste says. "This suggests that older adults have developed better psychological coping mechanisms and/or social support systems. "Another possibility," he adds, "is that younger adults are dealing with unique stressors. Either way, it seems that older adults might be able to offer a certain amount of perspective and wisdom when it comes to overcoming life's challenges." Jeste and Thomas encourage intergenerational social activities arranged or promoted by professionals, a situation that would provide younger adults the opportunity to learn from the older adults. For social workers working with older adults, this could mean reaching out to youth-based nonprofits and organizations to foster connections or vice versa. Mentoring opportunities, long or short term, could benefit all parties, young and old. Additionally when working one-on-one or with a specific age-based population, social workers should ensure they use a holistic approach, taking into account the entire individual—not simply judging someone by their physical health and making inferences regarding mental health. "There is no 'one-size-fits-all' treatment, and age should be a factor to be considered when choosing an approach," Thomas says. "Importantly, the view that there is a 'fountain of youth' that all older adults should seek is inaccurate. Youth is associated with worse mental health, despite excellent physical and cognitive function, and can benefit from guidance by older adults." The most important thing, however, that social workers must take from this study is that today's commonly held view of aging adults isn't accurate and, in fact, could be detrimental to how older adults are treated. "The prevalent misperception that older people are a burden on the society needs to change," Jeste says, with Thomas in full agreement. "The increase in numbers of older adults in the United States and other countries should not be considered a 'silver tsunami' of disabled, depressed, and demented elders but can be a 'golden wave' of wise and happy older adults who contribute to the well-being of younger generations." — Sue Coyle, MSW, is a freelance writer in the Philadelphia suburbs and a frequent contributor to Social Work Today.